January | 2014 | What Am I Thinking? 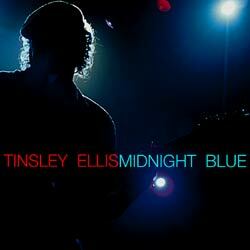 Tinsley Ellis’s “Midnight Blue” is the kind of album I wish Eric Clapton still made; full of energy, intensity and old-school musicality. After Springsteen, this might just be my favorite album from what I’ve heard so far this year. Tinsley, equally skilled as a blues vocalist and guitarist, serves up his talents in pretty much every flavor the blues can be rocked, shuffled, dragged or stomped. There are even a couple of tracks that have sort of a mid-tempo, adult contemporary radio kind of feel going on. So it’s well grounded in familiar territory, but it never gets repetitive. “Surrender” seems like the obvious choice for a single. It could easily seduce your ears with its smooth vocal emphasis and tasty laid back guitar fills supported by a simple rhythm section that’s solid as a tree trunk. It’s also one of the least bluesy songs on the album, so I feel I should counter it with “That’s My Story” a somewhat tongue-in-cheek rocker about irreconcilable differences played in a style that early ZZ Top fans will be familiar with. Both tracks are on the What Am I Listening To 2014 Playlist. “Just Like Fire Would” has been running through my head since I started listening to “High Hopes”, so I’ve added it to the What Am I Listening To 2014 playlist as a second selection from the album It was originally performed by Australian rockers The Saints back in the mid 80’s. Springsteen and the E Street Band started performing it during their 2013 tour of Australia and apparently it stuck with them too. They do a good job of making the song their own. A brief look at the Google machine shows me that the Saints got their single up to 29 in the Australian charts back in the day. Springsteen looks set to do a bit better with it on an international scale – there’s a new video out. If you’re interested, here’s the original version by The Saints. 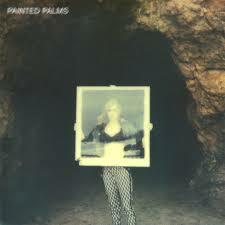 “Forever” by Painted Palms is an album of tracks squarely aimed at your radio, provided that your radio is located in the mid 1960’s. The songs are primarily straight-up mid tempo 60’s pop rock with a couple of nice ballads thrown in. They usually contain catchy melodic hooks that will remind you , in turns, of artists from that era such as the early hollies, the zombies, the move and even the Beatles and the Beach Boys, especially in regard to songwriting style and overall feel. Of course over that you’ve got this whole lo-fi thing going on, which means the production is a bit left of center from what might be authentic 60;s production style. Sometimes the sound is a bit harder on the ear than what you might expect or want from these types of light pop songs. 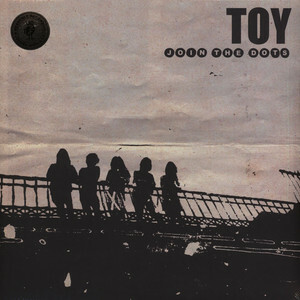 But unlike Toy, who I commented on previously, the production tricks on this album mostly augment rather than detract, giving the album a psychedelic haze. Occasionally I feel as though I’m listening to old vinyl 45s on a cheap portable turntable, which may be as intended. nice upper mid-tempo pop song with another good hook. In the end I’m kind of left feeling that they might have had more mass appeal if they had polished it up a bit. Then again, maybe that would be true only if it actually was the mid 60’s. I recommend giving this one a shot if any of the name checks above interest you. “Forever” and “Soft Hammer” are tracked back-to-back on the album. That’s good enough for me. They’re now on the What Am I Listening To 2014 Playlist. 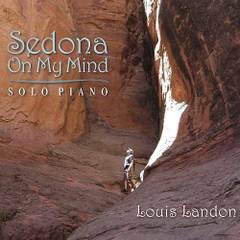 “Sedona on My Mind” is a pleasant collection of solo piano compositions by Steinway artist Louis Landon. There are variety of moods and emotions on this album yet they all stay within the margins you would expect from a pianist for peace. The music draws on his classical and jazz training without getting overpowered by either style. The tracks showcase Mr Landon’s considerable technical proficiency as well as his ability to evoke emotion gently. “Sedona on My Mind” has received a One World Music Award nominated for solo piano album of the year. Listening to the album will tell you Louis Landon is an experienced performer. Although you may not be familiar with him, he’s been playing professionally since the early 70’s. Louis toured with the bands of John Payne and John Hall, performed at the “No Nukes” concert. He’s been releasing his own albums since the mid 90’s. There is a little too much going on here for meditation, but it’s a perfect album for morning coffee, late night chilling, or helping you stay calm and cool while getting some work done. I’ve added the title track to the What Am I Listening to 2014 playlist. 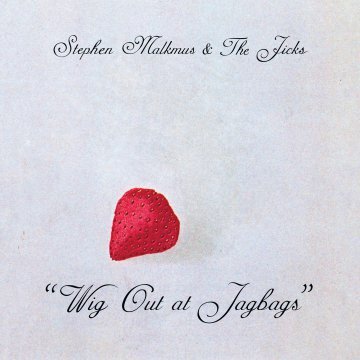 On the appropriately titled “Wig Out at Jagbags”, former Pavement frontman Stephen Malkmus seems to have something to say about everyone he encounters. from aging punks to surreal teenagers, from Houston trucker drivers to pop chart toppers and many others in between. Right from the start you can tell this album is going to have a bit of personality. Each song is a pretty much a uniquely creative construct with good stylistic diversity and enough interesting ideas, quirky lyrics and unusual melodies to fill out the album. There’s a solid foundation of pop hooks here, and you can hear how this album could have gone in a more polished direction had that been the vision, but the lo-fi production and twisted arrangements might make this music an acquired taste for some. Over the course of the album you’ll hear everything from ELO-style harmonies to atonal guitar fills. Personally I like that sort of thing when it’s done well, as it mostly is here. Think Beck with a soupcon of Rundgren and a few dashes of Zappa with a bit of rough sandpaper run over it all and you’re halfway there. This album might not burn down the charts but it’s worth hearing if you’re looking for something a bit off center within the margins of an enjoyable listening. I’ve chosen “Houston Hades” for the What Am I Listening To 2014 basically as a gut decision. It struck me as perhaps having a wider appeal than some tracks, yet It will give you an idea about the album. There really isn’t a track you could call representative of the whole. Railroad Earth hail from New Jersey, although you’d never guess from listening to them. This is the first time I’ve listened to or, in fact, heard of them even though they’ve been kicking around since 2001. Their latest album. 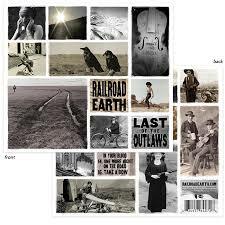 “The Last of the Outlaws”, starts off with two mid tempo country rockers, emphasis on country with a hint of blue-grass on the latter, on either side of a jazzy ballad. So far so good. Solid songs that leave an impression, are easy on the ear, and for the most part have decent lyrics. Since I was at work on my first listen, I must confess that my mind had settled back to business by the time the fourth track began, only to be taken right back to the album by halfway through the next track “All That’s Dead May Live Again”, a song that begins firmly rooted in celtic influences, then proceeds into an extended instrumental showcasing pretty much all of their country/ jazz/ rock/celtic/etc. influences. As the album progressed beyond this point I began to suspect that these guess might have more than a few Grateful Dead albums in their collections. “Hangtown Ball” reminds me a bit of a Hunter-Garcia composition, and the vocalist even sounds a bit like Gerry on occasion, and you’ll notice a touch of Phil Lesh lead bass from time-to time. I don’t mean to imply that Railroad Earth sounds derivative – they are definitely their own band. But the comparison might give you a clue as to whether this album will appeal to you. I think it’s well worth a listen. I could have chosen one of the “normal” sounding tracks for the What Am I Listening To 2014 playlist. There are plenty that are worthy. Instead I thought I’d go with “All That’s Dead May Live Again” Partially because this was the one that pulled me back into the album and partially to show that there are still people releasing music like this. And since that song segues seamlessly into “Face with a Hole” (seems to be a two-parter), I’ve included them both. The total running time is about 20 minutes. You’ve been warned, LOL. How much you like this album may depend on how much you like your pop rock drenched in an overabundance of flange, phase, overlapping delay and other effects. It’s all a bit too much for me. Although you can clearly hear guitars being played with some proficiency and some interesting melodies and chord structures that could be influenced by mid-60’s psychedelic pop, this is still the kind of album on which you get to hear a lead-effect solo played over what may be a single note, chord, or some noise of a particular color. Having said that, as latter day psychedelic rock albums go I much prefer this to last year’s Hookworms album, for example, which I could not relate to at all from first listen to last. There’s a part of me that wants to like this album, but any emotional connection I might have made seems to be blocked by that impenetrable wall of overprocessing. I went through the entire album trying to pick a souvenir for the playlist, and wound up with the title track. Not because I like it better than any of the others, but because it contains the best example of what I mean by a lead effect solo. Also, it’s as representative of their sound as anything else. I’d like to hear what this album sounds like au natural. I suspect I might have a better response to it. I know that bands struggle to find a way to make themselves easily discernible in a crowd, but in this case I think less excessive production would serve them better in that. I can see from Metacritic that there are many people do like this album. Enjoy. You can hear the song “Join the Dots” in the What Am I Listening To 2014 Playlist.